As a chef and passionate foodie, I adore exploring local markets wherever I travel. When visiting a market, I get a sense of the people, cuisine, environment and all the sights, smells and tastes that go along with it. My most recent market adventure inspired me to make this mango cabbage slaw. Filled with lots of fresh and vibrant flavours, I hope you enjoy it as much as I do. Place all ingredients in a large bowl, except the peanuts. Use your hands or a spoon and mix together. You can serve this immediately or leave the flavours to marinate for an hour or so in the fridge. Before serving, garnish with some more cilantro and sprinkle with peanuts. 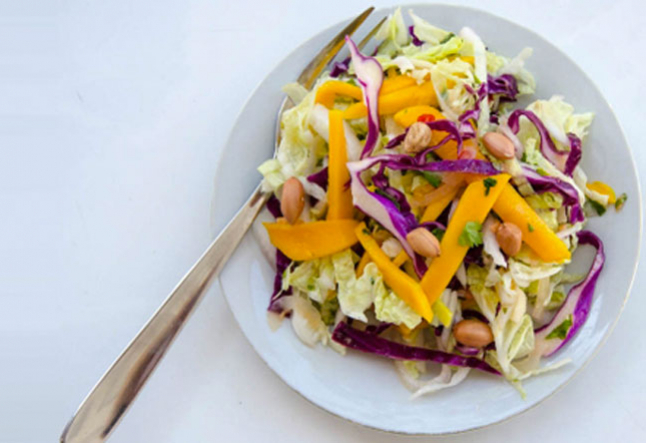 About your mango: This salad will work well with any variety or ripeness of mango, whether sour or sweet. Use the one you can get, or that you enjoy the most. In general, a somewhat firm, not overly ripe mango holds up best, but all will be delicious in this salad.